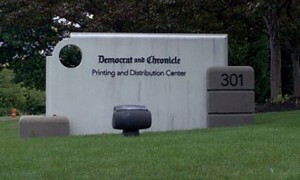 I was invited to a tour of the Democrat and Chronicle’s printing facility at Canal Ponds Park in Greece. I thought it would be interested, but I did not think it would be eye-popping. Complete pictures are available at this Dropbox link (no account required). Did you know that the facility prints not just the D&C daily and weekend papers, but also the local distribution copies of the New York Post? I did not. But it makes sense for the Post; if you are going to sell copies of your paper in external markets, it’s much cheaper to make them where you will be selling them and distribute them from there. Did you know that the carriers that bring you your paper are either picking it up in Greece or Webster and that they are responsible for putting it in plastic bags, rubber bands, ensuring that the sections are set properly, and basically everything that affects the way you see your paper delivered? I did not. That makes sense for the D&C; if you are going to produce a product like a newspaper and distribute it, let your distributors do the work of packaging it and focus on your core ability to print the paper (and maybe to ship it to a distribution site). Gone are the days of kids throwing stacks of twine-enclosed newspapers on the sidewalks – if you can’t drive to pick up your share of deliveries, you can’t be a newspaper delivery person. I also found out that a roll of paper weighs about a ton, comes from Canada, is spun through the German built, 20 year-old printing press at about 60 miles per hour, and it takes about 40 of them to print the paper. They move through the facility on a mini-railroad type cart embedded into tracks in the floor and the paper for the D&C is separate than the paper for the Post. From a logistics standpoint, breaking news is printed last, real estate and car sections are printed first, and the entire process is monitored using Swiss-made control technology. 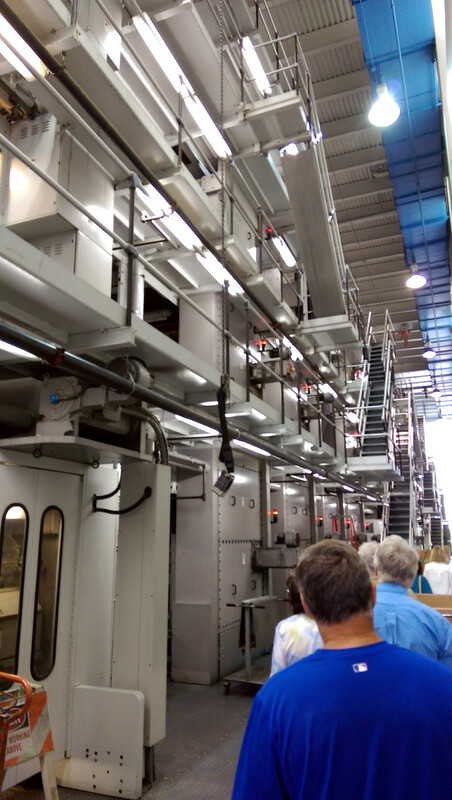 The press itself prints different colors on different floors, sending paper up and down and around to be printed, folded, reviewed, and finally packed and shipped in a huge warehouse like facility that is evocative of something out of Fritz Lang’s 1927 classic Metropolis. In today’s world of digital content and delivery, it is nice to see that there is still a well-oiled, state-of-the-art facility in Rochester printing newspapers for not just the local newspaper, but others as well. People still play a key part in creation of the paper – moving and loading the huge rolls of paper, ensuring the correct mixture of ink and water, and checking the final product against proofs on a screen to ensure that colors come out correctly. During the tour, we had a cyan print nozzle get clogged and spew dots of blue onto the edge of the paper. After a minute or so with some extra water through the nozzle, we saw it clear up and go back to normal without further problem. Thank you to the Democrat and Chronicle for the opportunity, and I look forward to seeing what the next 20 years of printing innovations brings to this hidden gem of the Rochester manufacturing world.